Scientific research and constant formula innovation are the strong points of cosmetics based on marine biomimetics (imitation of marine natural elements). Founded on the natural similarities between marine elements and mankind: algae cytoplasmic membrane contains effective defence and conservation systems similar to those of the skin and there is an extraordinary similarity between human and sea plasma. Fabbri Cosmetica has developed an effective line of products based on these affinities, using precious ingredients that can be assimilated and perfectly tolerated by the skin because of their similarities. For each product, research focusses on the perfect mix of active ingredients and on adequate and safe work protocols, which guarantee maximum satisfaction to the user. The sea represents one of mankind's essential energy sources: in the sea body and mind find the right balance and researchers in the food and cosmetics pharmacological sector study marine active principles to solve all types of issues, aware of their importance as a source of solutions for human health. 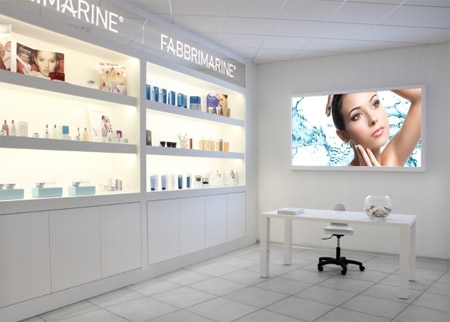 Based on these principles, Fabbrimarine products’ objective is to find the best solutions by following a scientific approach aimed to solve specific imperfections in relation to different skin types. In the lab, through lyophilisation of the functional substances and osmotised water, the objective is to maintain the products functionalities unchanged, while offering the skin a product of superior quality. Fabbrimarine products are not tested on animals. Formulas are approved by the best certifying centres. Research, production and packaging undergo strict quality controls to guarantee total reliability. Customer pre- and after-sales support is internationally recognised and appreciated. Fabbri Cosmetica, is a leading company in the beauty and wellness services sector with forty years of experience; its philosophy is based on the constant search for knowledge, the quality of its cosmetic products, state of the art technologies and the professionalism of its operators, who regularly receive training updates. Proud of its formulas, Fabbri Cosmetica focuses in particular on teaching the correct interpretation of cosmetic ingredients (INCI). The beauty operators who use the formulas on a daily basis, know and understand their properties, and therefore are fully aware of the benefits of their work and its effectiveness. Fabbri Cosmetica, with the help of its professional in-house communications team, accompanies beauty operators from the opening of their centre, starting from the graphical aspects of its brand, to the main communication tools (business cards, promotional leaflets, and graphical elements for the centre). Fabbri Cosmetica support also includes the creation of a state of the art website, an interface with clean graphics, optimised for mobile devices and with high-rankings on search engines.